Latest arrival June 2018 in Grainpro, new crop coffee. We have some history with this coffee - we first came upon it when we were on the jury of the 2006 Cup of Excellence. It was an outstanding cup, our personal favorite of the competition, where it wound up taking 5th place and garnering a Presidential award, given to coffees that score over 90 points (it scored 91.43). We bought the coffee that year at auction and offered it to our customers. We later found out that it was the same coffee that had placed 1st the prior year, with a record (at the time) for the highest price paid for an auction coffee - $49.75 per pound. In a way, this was the first big price competition coffee, though that record has been topped many times since. 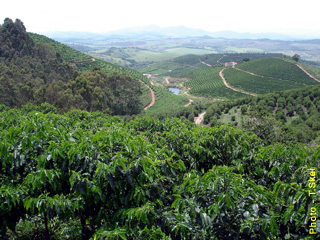 In 2007 no Cup of Excellence was held in Brazil and we were able to purchase the coffee directly from the farm. In 2009 the coffee placed 8th in the CoE. Then, the coffee kind of went off the radar for us. At the Specialty Coffee Association show in 2012 we attended a blind cupping of Brazilian coffees, where we were mainly impressed by one coffee in the room. We offered to buy some, without knowing its name. Well, as you have no doubt guessed, it turned out to be Santa Ines, our old friend. Varietal is Yellow Bourbon and processing is full natural, which means the coffee cherry is fully dried in its skin so there is some fruit flavor penetration into the bean within. Fazenda Santa Ines is located in the municipality of Carmo de Minas in southern Minas Gerais at the foot of the Mantiqueira mountains. 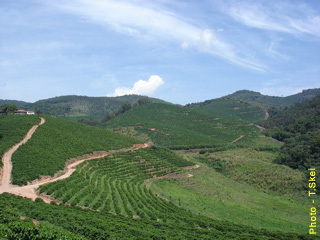 When the farm was acquired by the Sertao Group in 1979 it was already planted in coffee. Soon thereafter work began on planting more fields, building new concrete drying patios, and installing a washer, dryer, and processing machine. The Sertao Group is highly committed to environmental conservation, witnessed by the fact that it has preserved a large area of native forest on the property and protects all the mountain springs and creeks as well as the vegetation along their banks. Social responsibility is also taken seriously on the farm: 13 homes for workers and their families have been built on the property, complete with the necessary infrastructure, including water, electricity, and a sewerage system. The houses are occupied by 35 employees on payroll and their families, or a total of 80 people. The rest of the workers' families live in Olimpio Noronha. In addition to their wages, all the families receive milk, coffee, medicines, and other assistance, and they have access to soccer fields, a sand court, and a quoits court for recreation and sports. Employee's children who are studying can easily get to school: a bus passes by the entrance gate several times a day and takes them there. Because of the topography, harvesting at Fazenda Santa Ines has always been done by hand, the cherries being collected on a cloth. 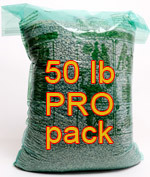 This precaution is taken so that the coffee will not be contaminated or lose its quality. Once they are picked, the cherries are taken to Fazenda do Sertao, another partner in the Sertao Group, where they are washed, pulped, and spread out, always with a view to obtaining a high-quality product. 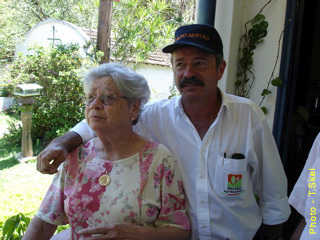 In keeping with the Sertao Group's philosophy to continuously strive to improve the quality of their coffee, personnel from Fazenda Santa Ines often visit national and international sites to exchange experiences with other growers in an ongoing effort to raise the bar for the coffees it produces. Cup Characteristics: Fazenda Santa Ines is a very sweet, bright coffee with hints of lemon and clove. Nice fruit penetration, more than most naturals from Brazil. The citrusy character is very striking, but it possesses a delicate texture and a layered, complex taste. Very aromatic, with chocolaty body, a creamy mouthfeel, and a long, sweet finish. Clean, sweet and well processed. An outstanding cup and excellent value. Roasting Notes: We prefer to stop this coffee before the outset of second crack, in order to preserve citrus notes and brightness. To roast it too dark would mean that many of its subtleties would be lost, but be sure to have a first crack plus at least a full minute of development time and possibly first sounds of second crack.